For more whole grains use whole wheat pastry flour or blend ¾ cup whole wheat flour and ½ cup all-purpose flour. Add 1-2 Tablespoons of water or milk if batter is too thick. 110 Comments for "Favorite Pancakes (without eggs)"
Followed the recipe exactly and put it in the waffle iron. They turned out really good. We have egg allergy so this is perfect for us. Thanks for the recipe. This looks great! My son is allergic to several things, including wheat, oats, and rice, so all purpose flour and gf all purpose flour are not options. He has passed many ancient grains, though, so I am wondering if you can make suggestions about what might work well here? So far, he can have sorghum, millet, and tapioca flours, as well as cornmeal. We will be trying amaranth soon, and I expect him to pass that as well. I am open to other suggestions for things to try, as well, if you think there is another grain or type of flour that may work well. You may still need to combine some flours from different grains to obtain the texture you like but their trials are a really helpful place to start. I just tried this recipe yesterday, but the outer layer was hard and the inside was dense and moist. What could be the possible causes? We need a little more information to try to figure this out. Tell us if you made any ingredient substitutions and describe the final pancake in a little more detail. The only ingredient I substituted was using goat's milk instead of nonfat milk. The outer layer of the pancake was hard and dry, the inside was dense and not fluffy at all. Could it be I overmixed the batter? I mixed till there was no lumps to be seen. Should I have left the batter lumpy instead? How much oil should I use to cook the pancake? Here are our suggestions. 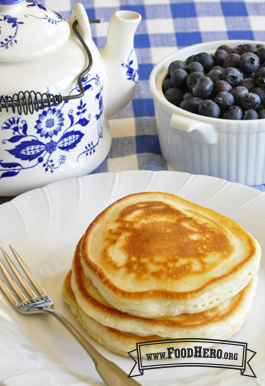 Overmixing could contribute to less tender, dense pancakes. A very thick batter will also take longer for heat to reach the center. Try adjusting the heat or thinning the batter with a little more milk or water. Adjust the temperature so a drop of water just sizzles and skips across the pan surface. If the pan is too hot, the outside overcooks before the inside is heated through. Too much oil on the skillet or griddle could contribute to a hard dry outside. Try just wiping the skillet or griddle with a little oil on a paper towel. Can the sugar in this recipe be replaced with Stevia? It probably can but we have not tested it. Keep in mind that pure stevia is about 200 times more sweet than sugar. There are different forms and strengths of stevia products available so the first place to check for substitution amounts is the stevia label. If you have pure stevia powder, you might try 1/4 teaspoon stevia powder to replace 1 Tablespoon sugar. Is this recipe suitable for someone with gluten intolerence. Not sure what flour to use. This recipe is not for someone with gluten intolerence because as written, it contains wheat flour. Look for something labeled as a gluten-free all-purpose baking flour. If it is called a baking mix rather than flour, it might already have the leavening added. Read the package directions but more than likely you will substitute the gluten-free flour in the same amount as given for flour in the recipe. I made these w a few slight variations and they were THE BEST pancakes I’ve ever had. I used half all purpose flour, and half coconut flour. I used coconut oil instead of vegetable oil. And I used almond milk, and much more than the recipe called for. The pancakes smelled like custard pie when they were cooking. And they were so light and fluffy when they were done. I topped w fresh strawberry’s and maple syrup. Amazeballs! These are really good. I make them using rice milk. Son has egg and dairy allergy. Could you make waffles with this batter? We tested this batter in a waffle maker and it made a nice crispy waffle. The batter is thin so it spread out but it puffed up nicely to fill out the waffle iron. Be careful not to add too much batter. This recipe was amazing when my daughter was allergic to eggs. She outgrew the allergy, but we still use the recipe all the time! Replacing the all purpose flour completely with whole wheat pastry flour works beautifully. I have made this with groups ranging from young children to adults and they all love this recipe. My teenage daughters frequently make these pancakes at home. My oldest daughter is lactose intolerant; lactose free milk and soy milk work great in this recipe too. The Food Hero Any Berry Sauce pairs well with the pancakes. These pancakes are amazing! My in-laws are from India and are vegan. When they visit, they always want to try American food, but so much of it has eggs. I tried this recipe today (with a few blueberries thrown in) and it was amazing!!! I will be sure to make it for them next time they come so they can have an authentic American pancake. Thank you for a great recipe! I love this recipe. When my son was a baby, he was allergic to egg, so this recipe was a godsend. He has since outgrown it, but it's still my family's go-to pancake recipe. The only changes I've made is to use white whole wheat flour instead of all-purpose and whole milk instead of low/non-fat. They're perfectly fluffy and a perfect consistency every time, whether I add fruit or not. Thank you! I’ve made these a few times but they’ve always been a little bitter. Tried again this morning, but used 1/4 cup sugar. They were perfect! I've followed this recipe quite a few times. This morning I had no baking powder, so I used self raising flour and it turned out REALLY well, I'm actually going to switch to using self raising flour all the time for this recipe. I also always add a splash of vanilla extract and an extra tablespoon of sugar. Good idea if you have self rising flour on hand. The proportions of baking powder to flour are slightly different but it can be successful. Self rising flour also contains salt so you might want to omit the salt in the recipe. A fantastic find. My eldest is allergic to egg. This allowed us to do a family pancake day and are now a favourite weekend treat breakfast. Do you think the recipe would work for Yorkshire Pudding? Also is it possible to translate the recipe in to European with solids being measured in grams and liquids in millilitres? We're so glad this recipe lets your family enjoy breakfast together! Yorkshire Pudding is made from a batter using eggs, flour and milk or water. It is a very liquid batter and as it bakes, steam from the liquids cause it to puff up. The protein in the eggs hold it together so it would be difficult to eliminate them. The recipe could be translated into European measurements but we do not have the resources to do that. If you have a scale and metric measuring utensils, try measuring out the ingredients as written in the recipe and then weighing or transferring them to metric utensils. I don't have vegetable oil, can I use butter or olive oil instead ? Great recipe - added to it, just a bit! I followed this recipe to a T, but the batter came out very runny, so I added about 1/3 cup more of flour to thicken up a bit. Also, I took note of the comments that said the pancakes came out a bit bitter, so I added 1 tbsp more of sugar. The pancakes came out light, fluffy, and my family loved them!!! I had no vanilla extract or eggs at the house at the moment, so this recipe was a life saver for people asking for pancakes that morning! I followed the recipe perfectly and even used the ¾ wheat, ½ all purpose flour and adding banana suggestion. The pancakes turned out pretty fluffy and light alright, but had a slight bitter taste to them. And I'd use baking powder and not baking soda. I registered just to comment. What went wrong? This is kind of a puzzle. Check your individual ingredients, especially the whole wheat flour. If it were beginning to turn rancid, it might give a taste that could be described as bitter. can i substitute baking powder with baking soda? Here are some quick and easy recipes to make and enjoy in no time.